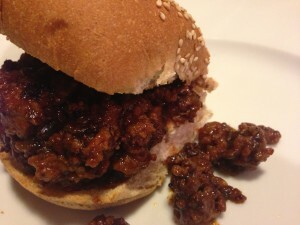 Super Sloppy Joes. 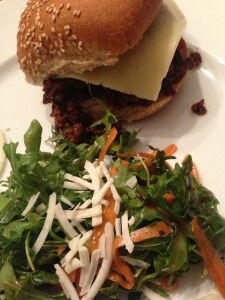 One of the most kid-friendly meals that grown-ups love too, sloppy joes are a mainstay in the American household. 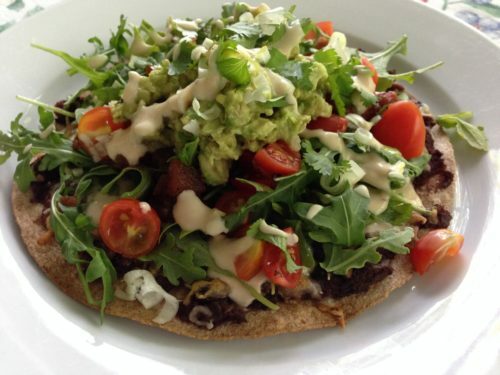 Easy to make, and tasty, it’s a great way to get kids to eat their dinner. 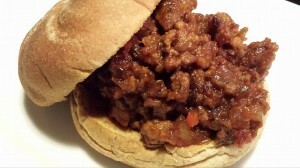 My Super Sloppy Joes will satisfy the adults, too. 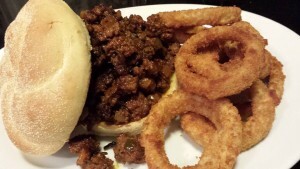 The Sloppy Joe Sandwich is said to have been invented in Sioux City, Iowa, yet there are other stories about its origin. 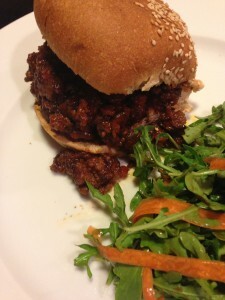 An interesting article about the history of the Sloppy Joe can be read on the Blue Apron blog. Start with ground meat — you can use chicken, turkey, or beef — and saute with some onions and red bell pepper until the vegetables are soft and the meat is cooked. 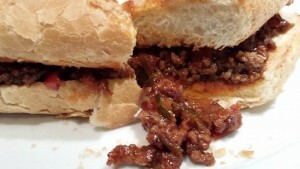 For my sloppy joe sauce, I use ketchup (you may call it catsup) instead of tomato sauce because I like the spicy richness it adds to the dish. Sweet pickle relish also adds some spice and texture, although you may want to omit the relish for your kids’ sandwich filling, and add instead to the adults’ portions. 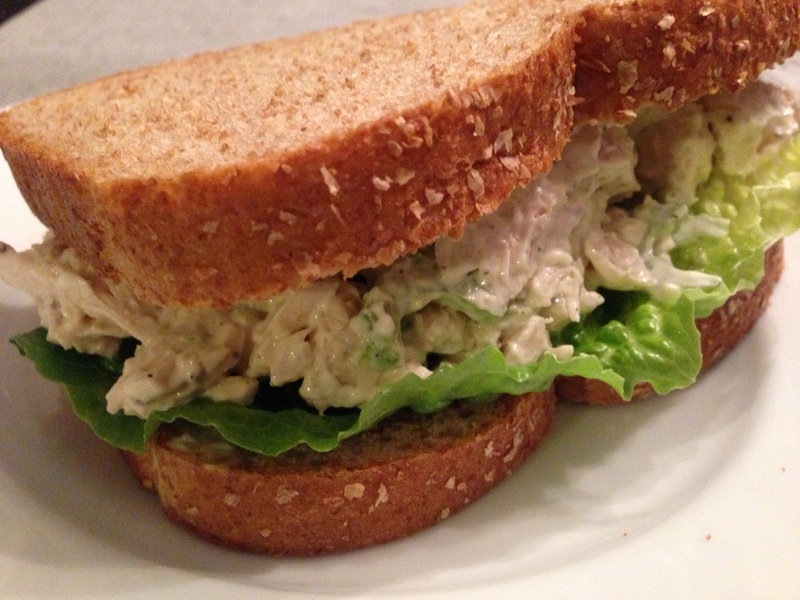 It’s not a super sloppy sandwich as long as you let the filling cook down so it’s thick. Toast your hamburger buns so there’s a nice crunch when you bite into the sandwich. I like to put a slice of melty cheese on my sloppy joe sandwich. Serve these sandwiches with a healthy side salad, or not-so-healthy French fries, or onion rings! 1. 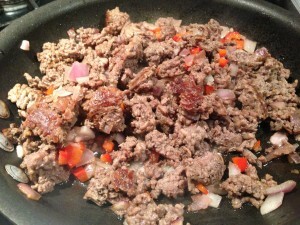 Brown ground meat and saute onions in olive or canola oil over medium heat in a non-stick pan. 2. 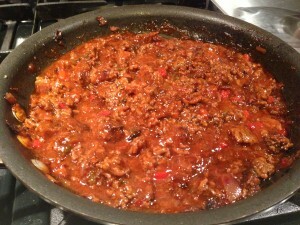 Add red bell pepper and saute until onions and bell pepper are soft. 3. Add ketchup/catsup and water. Reduce heat. Cook over low heat until filling thickens. 6. Serve on toasted hamburger buns. Serves 4 hungry diners. I like to serve a melty American cheese slice on my sandwich. This recipe works well as reheated leftovers — if there’s any left…. Serve with a cucumber salad, fries, chips, or onion rings. 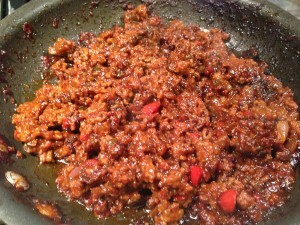 Variations: As mentioned, can use ground chicken or turkey or beef. Substitute tomato sauce for the ketchup/catsup and water for a different flavor/texture. 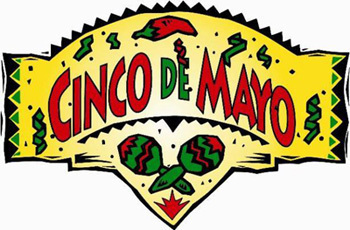 Some folks like it spicer so use chili powder. I’ve even had a bit of BBQ sauce in my sloppy joes over the years. 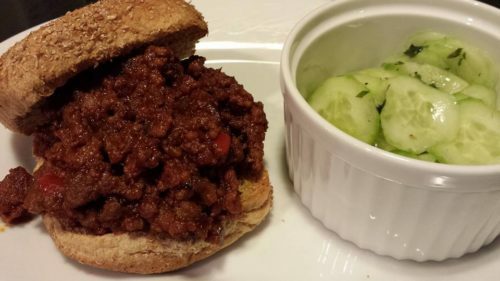 This sloppy joe filling also works well in tacos or wraps — fill up some hard taco shells or soft tortillas, top with shredded cheddar and chopped lettuce and tomato (roll up the wraps), and you’ve got a fast variation for dinner. Kids will love ’em!